ALMOST 200 years ago an eminent travel writer visited the hamlet of Powhillon on the coast of the Solway Firth and discovered "12 mud huts, with walls full of grooves and hollows". Powhillon is now a 280-acre farm, but some things never change: if you stand in the farmhouse and the farmer, Danny Quinn, stands in the stable, you can shake hands through a gaping "groove and hollow" in the structure. Powhillon is at the centre of one of Scotland's most intriguing land-use conflicts. The cracks are a symbol of the wrangle over the upkeep of a farm, which has been tenented by the family of Mr Quinn's wife since 1916. Equally symbolic are 145 permanently flooded acres, the fallen haysheds and 124 cattle which wade waist-deep in a quagmire which used to be pastureland. At the centre of the conflict are the 13,700 barnacle geese which migrate from their breeding ground in Spitzbergen to the Wildfowl and Wetlands Trust refuge at Caerlaverock. Mr Quinn farms just outside the reserve, but the voracious geese do not respect boundaries. The trust purchased Powhillon in 1975 in order to use it as a buffer zone in which illicit wildfowling could be controlled. Just before Christmas Mr Quinn made legal history when Dumfries Sheriff Court accepted that he had a valid defence for shooting protected barnacle geese: the protection of his livelihood from crop-loving birds. Locals now call him the "Lone Ranger", although he has promised to use his 12-bore sparingly. Buoyed by his success, he filed a sixth application to the Scottish Office Agriculture and Fisheries Division for a licence to shoot the species. On January 12, the Minister, Sir Hector Monro (Mr Quinn's MP), decided to grant the first licence to a farmer to shoot a Spitzbergen-bred barnacle goose. The trust failed to win an interim interdict at the Court of Session. Mr John Doherty, the centre manager at Caerlaverock, summed up the concerns of birdwatchers: "What this means in general terms is that there is no longer such a thing as a protected bird in Britain. "We are dismayed and astonished that the Secretary of State has granted a licence. Scottish Natural Heritage have been trying to negotiate an agreement with the farmer. Thousands of pounds would be paid to him to tolerate the geese. A compensation scheme exists on Islay, where farmers are paid £9.50 for every Greenland barnacle which dines on their acres. Mr Doherty says Mr Quinn was effectively offered £17 per goose in open court but he declined the offer as derisory. No other Solway farmer has had an offer of compensation, although some say they lose £15,000 every year. 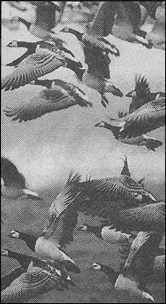 Solway's barnacle geese take off. Mr Doherty, a dedicated conservationist, looks upon the Spitzbergen geese as "a small and vulnerable population which were saved from extinction". There were only 400 of them after the Second World War, but there will probably be nearly 15,000 of them next winter an evironmental success story which inspired Dumfries and Galloway Regional Council and the area tourist board to adopt the species in their logos. The geese are still protected by the Wildlife and Countryside Act, by the EC Birds Directive, and by the Berne, Bonn and Ramsar conventions. They winter in a Special Protection Area and a Site of Special Scientific Interest. But the "Lone Ranger" is entitled to shoot a couple now and again if they descend upon his fields. Mr Doherty warns that Mr Quinns problem with geese and the long dispute over the maintenance of the farm are two separate issues. The Quinns sleep uneasily at night for fear that their house will eventually fall down. They have vowed to fight their landlords. The trust is on record saying it will not capitulate to unreasonable demands and it will not flinch from terminating the lease.